Irabu Island is the second largest island among the island that make up the Miyako Islands. 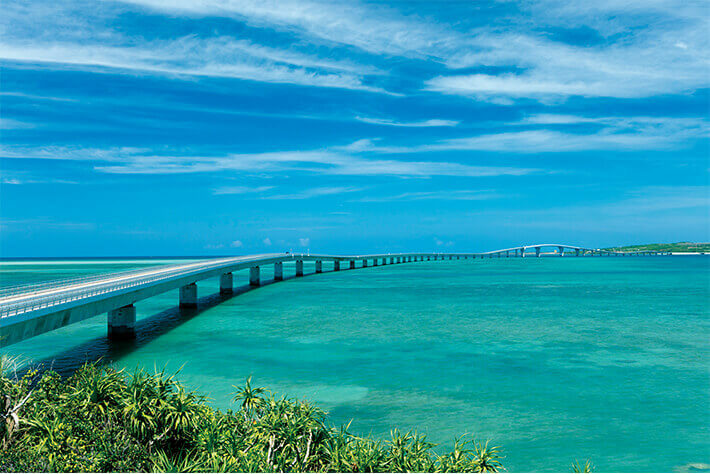 The Irabu Bridge opened in January of 2015, making it easier to visit from Miyako Island by car. Bonito fishing is thriving at the Sarahama Fishing Port on Irabu Island, which boasts an 80% share in Okinawa. 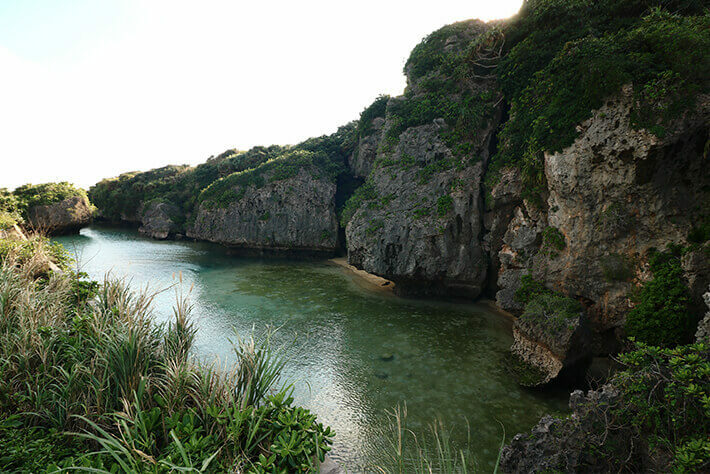 Irabu Island was also the first place in Okinawa to introduce a unique fishing method known as payao (floating fishing bank). Down the slope from the Sarahama Fishing Port, old houses of concrete structure form a village, tightly laid out in a narrow alley reminiscent of a maze. A scenery like that of a painting depicting a foreign fisherman’s town extends before your eyes. Tourist locations are scattered throughout the island, such as Sawada no Hama Beach, dotted with large rocks and selected as one of the top 100 beaches of Japan, as well as Toguchi no Hama Beach, where white sand stretches roughly 800m from the east to the west. The grey-faced buzzard, a migratory bird that travels to Irabu Island in the fall for overwintering, is a symbol of Irabu Island. 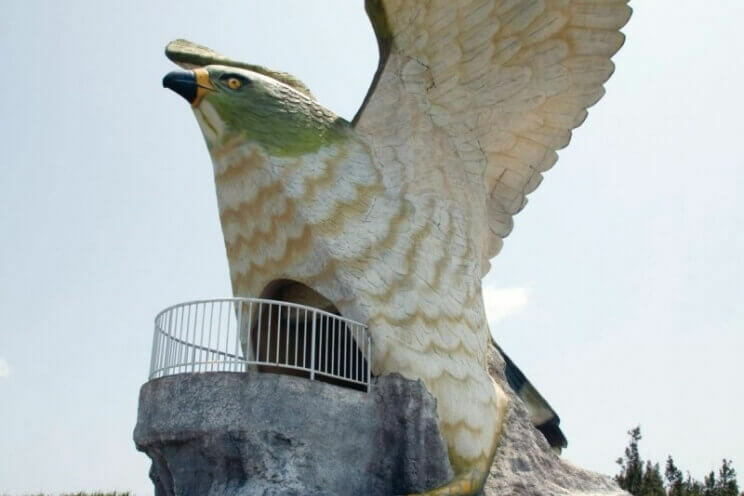 The Makiyama Observation Deck was modeled after the grey-faced buzzard spreading its wings in flight. Since the observation deck is located at the highest point of the island, you can get a bird’s eye view of Miyako Island, Kurima Island, and Ikema Island, in addition to the entire Irabu Bridge. 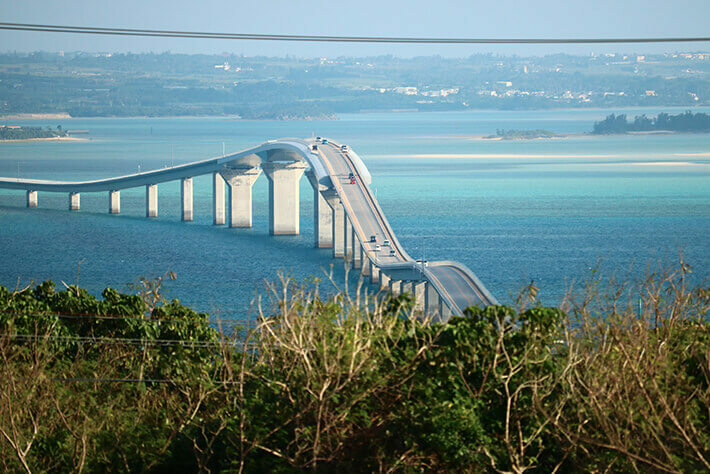 It is the perfect place to overlook the landscape of the island as a whole from a bird’s eye view and take pictures of the Irabu Bridge from exquisite angles. The trail nearby is well maintained, so you can also explore the abundant nature. 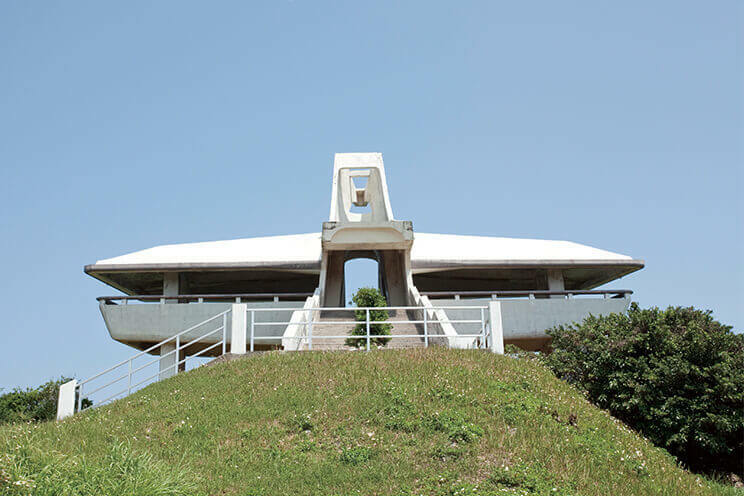 Various events on the island take place at Heisei no Mori Park near Sawada no Hama Beach. There are many sports facilities available, including the baseball field, athletic field, gymnasium, and pool. 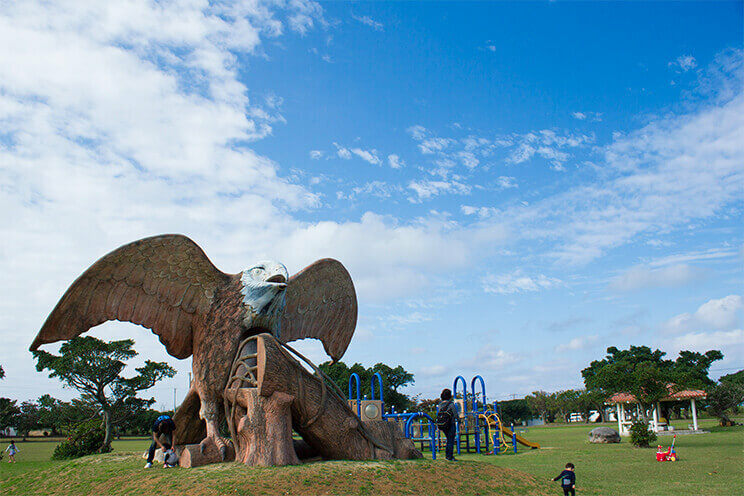 While the long slide shaped like the grey-faced buzzard is the main attraction, there is also playground equipment for smaller children, making this park a place of recreation for families living on the island. With its extensive facilities, Heisei no Mori Park can also be used as a resting place during your trip. Funausagi banata refers to the cape to send off ships in the local dialect of Irabu Island. The name supposedly came from the fact that people used to send off those leaving the island long ago. 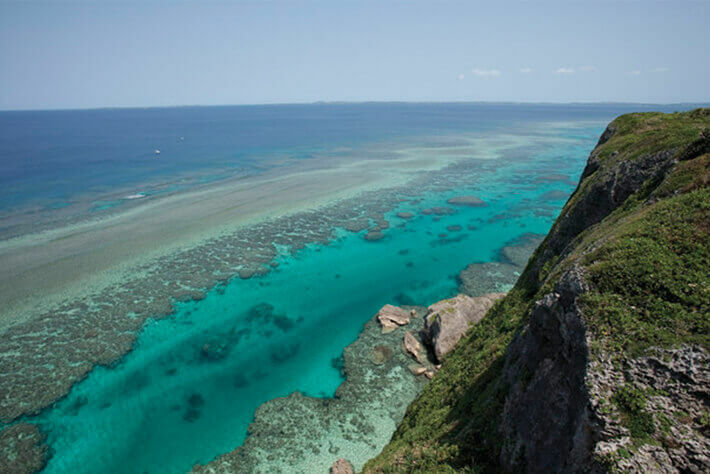 There is an observation deck at the cape that was modeled after the grey-faced buzzard, with the tail of the bird serving as the steps and the stomach as the observation platform, which overlooks the spectacular view of the Miyako Blue full of coral reef. The grey-faced buzzard, appearing as though it is about to fly off, seems to represent the feeling of wishing those leaving the island a safe voyage.